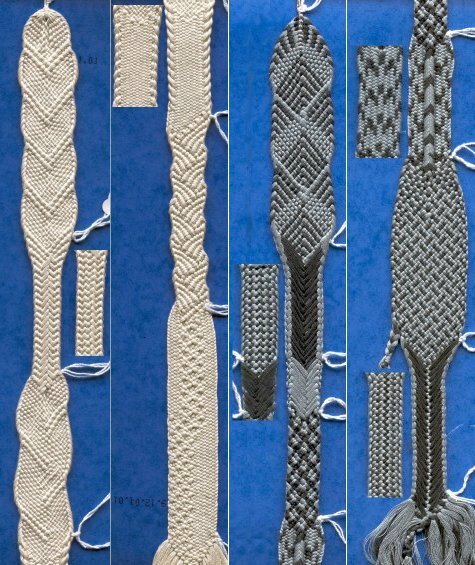 Since my last entry, I’ve been doing more pick-up takadai braiding using patterns from Makiko Tada‘s book on pick up braids and from Yayoi Miura’s web site, including some variations. After doing a few, I decided it was time to try a design of my own. My first thought was to try a Greek key design, but takadai braids are more suited to hexagons than to the right angles of a classic Greek key, so I ended up with a kind of double spiral. 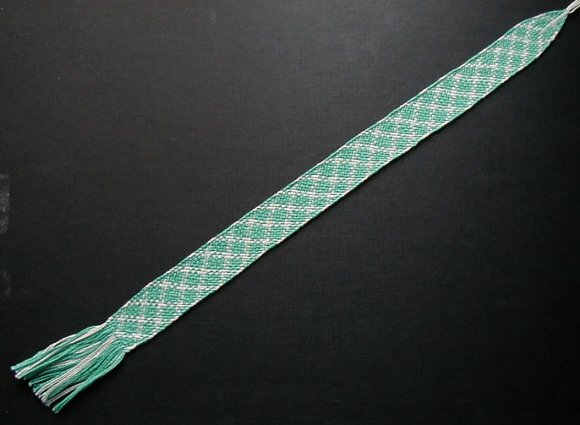 The picture shows the right side of the braid with the reverse side below it. Click on it for a larger picture. We went to a 3-day takadai workshop with Makiko Tada last month, which was great fun and very informative. I’ve finally finished the sampler I started there. 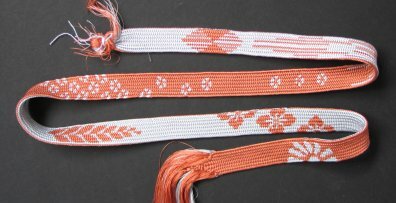 I’d decided beforehand that I wanted to focus on double layered pickup, even though I’d only made one double layered braid before (for an exchange). Pickup is fiddly, so it takes patience, but I love the result and I am impatient to do more. Click on the picture for a closer view. Back in April, I mentioned that I’d made my first takadai braid. I had to dismantle the takadai again so I hadn’t done any more until we were lucky enough to go to a two-day takadai workshop with Jennie Parry, held at the home of a Kennet Valley Guild member, Debbie. Between chatting, laughing, eating lunch in the garden and petting Debbie’s two labradors, we packed in a lot of braiding, but we still came home with unfinished warps. 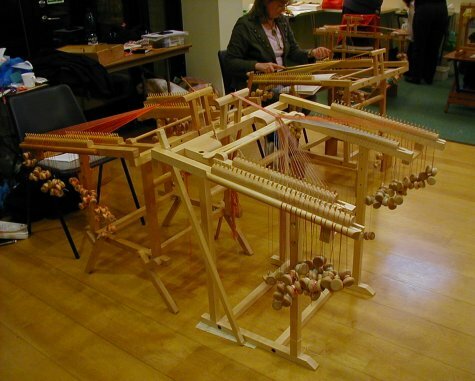 Fortunately, it is easier to re-install a warp onto a takadai than onto a shaft loom, so last week I managed to finish both of mine. Here is a picture to give you a taster of what we did, but for information on what a takadai is and how it is used, bigger pictures of these braids and details of the individual sections, click here or on the picture. We received our takadai back in January, but we set it up in a room we don’t usually heat so it has been too cold to work in there till recently. We have finally finished our first braid. Most of it is my work, but Rys used up the end of the warp. The edges are wavy and my beat was not as consistent as I’d like, but I’m happy with it as a first attempt. We have our first lesson in June, so I hope I will do better after that. Meanwhile, I will have fun muddling along on my own, working from books.